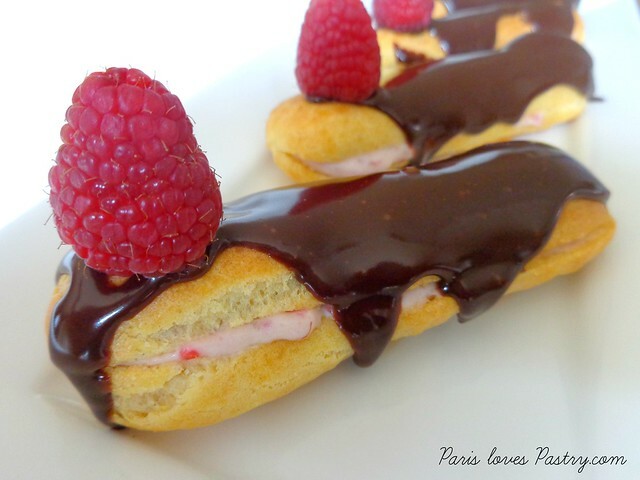 Paris Pastry: Raspberry Chocolate Éclairs for my 7th Blogoversary and an announcement! 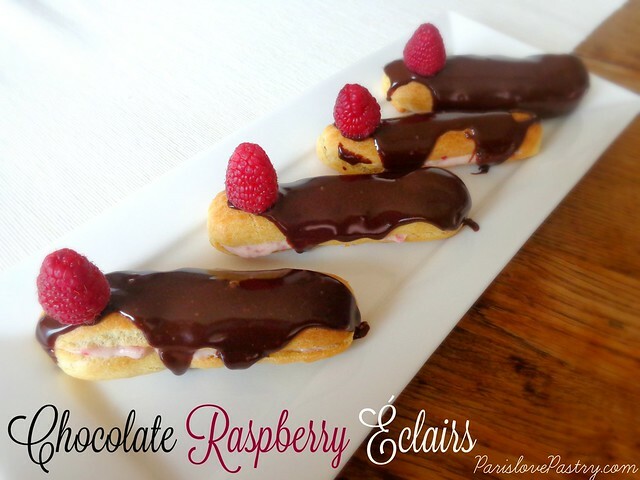 Raspberry Chocolate Éclairs for my 7th Blogoversary and an announcement! I feel like every year when February 4th comes around, I get sentimental about how many years I've been obsessed with baking and met so many wonderful people through this blog, but it is all still so very true! I can't believe 7,5 years ago I became engulfed with this hobby that would shape and form my life as it did. Whenever I'm having a bad day (just like everyone else, I have those too) or when I want to celebrate something, I bake. It releases tension, makes you forget everything, and the end result is (usually) so satisfying! Again, I would like to thank everyone that reads this blog. I know the blogosphere hasn't been the same since I started 7 years ago. Most blogs I became addicted to at the time, have dissappeared. And along with that, a good chunk of readers too. I'm not really sure why, and it's not just my blog. Maybe there are too many blogs to follow. Maybe people are too busy (that's the reason why I don't visit blogs so often anymore). Or maybe blogging is just a phase for most people. Not for me. I guess after 7 years I can say: it's a lifestyle! I'm so happy I kept up this blog after all those years! Sometimes it's difficult to find the time next to work and a social life, but I just love doing it and I'm quite proud of the blog. Well, what is a more fitting statement for a blogoversary than something completely new? After carefull consideration, I've decided to make an Instagram account all dedicated to Paris, pastries & my baking adventures! We're living in a complete cyberspace now-a-days anyway, right? If you're a follower of my other blog FrenchMadame.com (yes, on top of all that, I do that too), you'll know I have had an Instagram account for French Madame a while now, sharing beautiful images of home interiors and fashion pieces. It's become quite a succes. But what I'm missing on Instagram are good accounts to follow for pastries, desserts, & baking. With a dash of Paris images, here and there: Paris Loves Pastry on Instagram is a fact! Be my follower? :-) ParisLovesPastry on Instagram! So what to bake for such a special occasion? Why not go back to my "roots", and bake something out of the early days? I've decided I wanted to bake some éclairs again in the new year - and so I did! 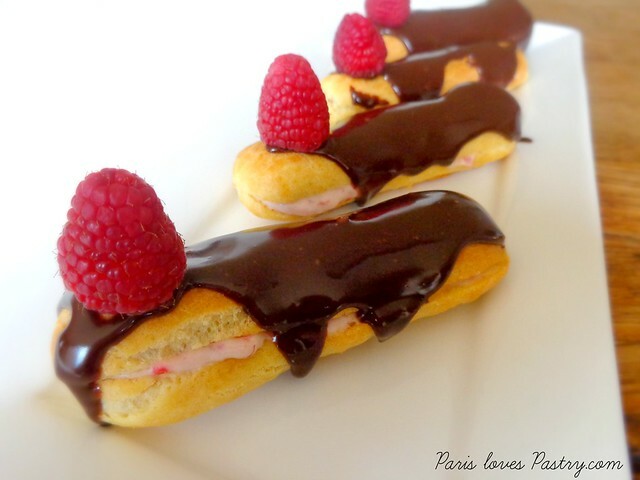 Raspberry chocolate éclairs to be exact. There's something fancy and pretentious about saying you can bake chocolate éclairs from scratch, and I don't understand why because they are quite simple to make. You just have to have some time on your hands. Now that, isn't so easy ;-). The éclairs were lovely and I love the taste of raspberry with chocolate, only sad thing is éclairs stay good for a day. So you have to eat them all in one go. No? Oh well. That's what I did. For the raspberry variation: add ⅓ cup of pureed raspberries to the pastry cream. Follow Paris Loves Pastry on Instagram here.